I’ve been a Jack-of-all-Trades all of my life. It’s a benefit — I can do things myself versus hiring someone to do them. It’s also a burden — everyone wants an expert, not a generalist. My photography is also Jack-of-all-Trades — I don’t have a style to indicate who I am, what I’m about. For example, look at the work of Davide Capponi, posting under the nom de plume rubicorno. His work is beautiful…. unusual…. distinctive. I would recognize it anywhere. Davide lives in Italy and does his beautiful work using an iPhone, iPhone apps, and photo editing software. He has been posting to his blog since December 2011 although he has “always been in love with photography.” He has found in three months with an iPhone what I have not found in 45 years with professional grade cameras…. a distinctiveness. Millions of people are out there with their smart phones, point & shoots, and DSLR’s. How can I be distinct and different, like Davide? In trying to find a photographic identity, I’ve been exploring digital photo editing software programs. Free — Picnik, Picasso, and Irfanview. Expensive — Adobe Lightroom and Corel Paintshop Pro X4. 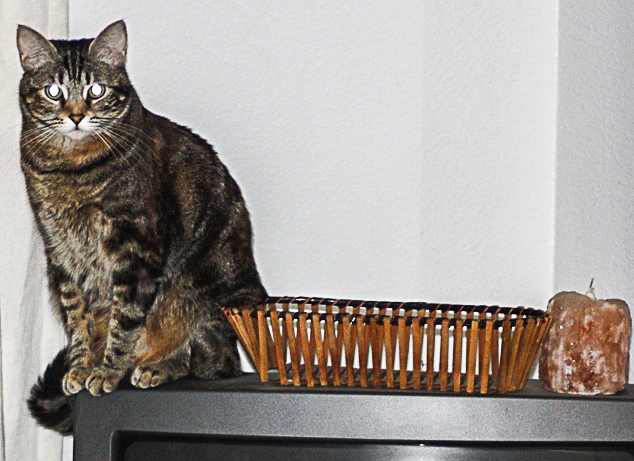 The Queen of them all (really expensive) — Adobe Photoshop CS5.1. I’m not a fan of black-and-white photography — Ansel Adams notwithstanding — but I like that. The sad thing is that I have no idea what I did, how I got there. 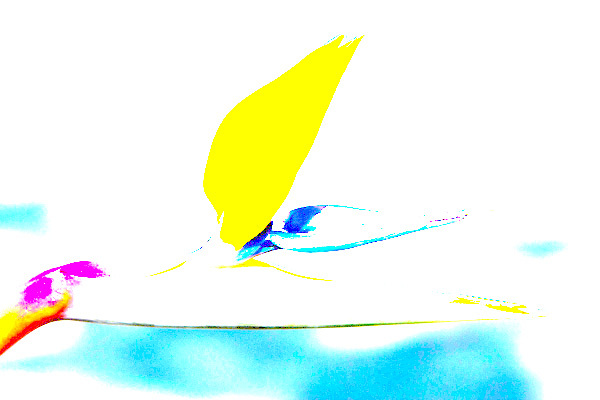 I was just exploring in one of the photo editing programs, liked it, saved it, and continued on…. The big, blank wall and the glaring cat eyes just made it a bad picture. I dislike deleting pictures, though, believing that I could do something to it to save them. I think I succeeded. Will I become the black & white cat photographer? Probably not. Therein, I think, comes back my Jack-of-all-Trades burden to haunt me. I like too many things that these photo editing programs do and just can’t make up my mind who I want to be…. or even who I am after 45 years of photography, even with over 70,000 photographs! Maybe you, my dear reader, can help. As I continue to explore, leave a comment letting me know what you like and don’t like, and why. That might be the clue that I’m looking for! I have hundreds of pictures of that flower. That’s my best. 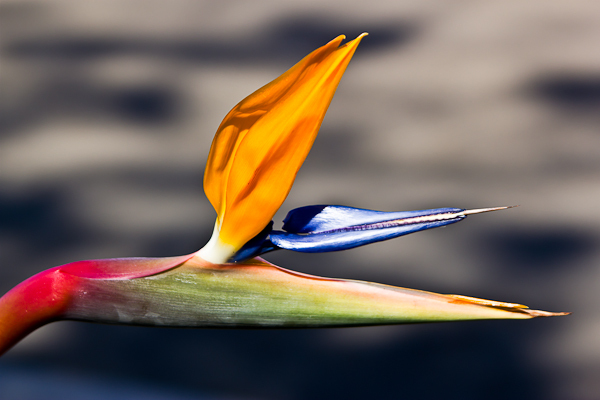 It’s still just a picture of a bird of paradise flower, though…. Happy day and happy blogging, my friends! 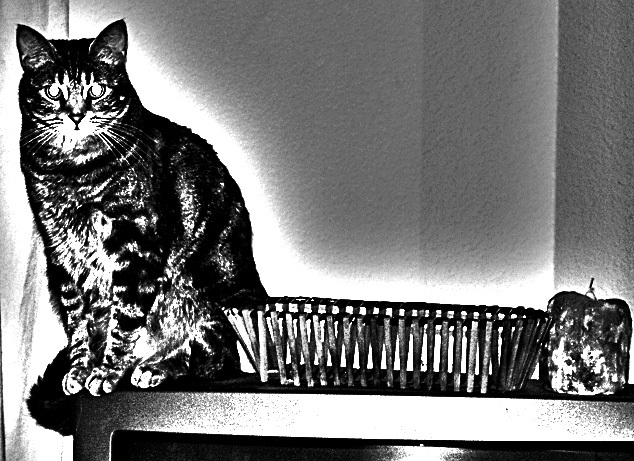 This entry was posted in Adobe, Corel, Digital photo editing, Fauna, Flora, Mother & Father Nature, Photos and tagged adobe, ansel adams, artsy, black and white photography, cats, corel, jack of all trades, lightroom, paintshop, photoshop, rubicorno, zoey the cool cat on February 8, 2012 by Russel Ray Photos. Ray, the funny thing is that I have always considered myself a jack of all trade as you do. Doing at a decent to good level many different things but never being a specialist of anything. And the same was true for photography until, well, a little more than three months ago actually, I started shooting and editing photos with my iPhone in March 2011. For some reason the limitations of the iPhone helped me define a personal way to shooting and editing, difficult to say why, but it was the first time in my life I truly came out with a personal and creative voice. I don’t know what would be good for you, but I think experimenting is a good way to open doors to yourself. Having feedback from others, see what works and what not is important as well I think, Instagram was for me a wonderful school. Thanks for the mention, by the way I love your bird of paradise shot!